Miss R has always loved cats. She has been asking for one for a few years and I always said we could get one later. Much later. It is not that I don't like cats. I just feel I have enough living creatures to keep... well... alive. I didn't really intend on getting a cat anytime soon. However a few months ago we visited a pet shop on a day when they hosted a pet adoption program. One of my friends was there with her foster cats. I thought Miss R would like to pat a few cats and maybe have a little play... An hour later we found ourselves adopting a gorgeous black and white boy cat named Boots. Boots was a little unsure about the girls and my husband for the first couple of days. He quickly worked out that I am the one giving him food and therefore belong to him. He was quick to show our pet dog that cats are a force to be reckoned with! Miss R could not be happier! Pretending to be a cat has become the most popular game in our household. It is so sweet and funny to see my girls crawl on the floor meowing! Soon after getting a cat we visited a local Spotlight store where I spotted soft grey corduroy with kitties printed on it. I showed the fabric to Miss R and it was adopted even quicker than the cat! 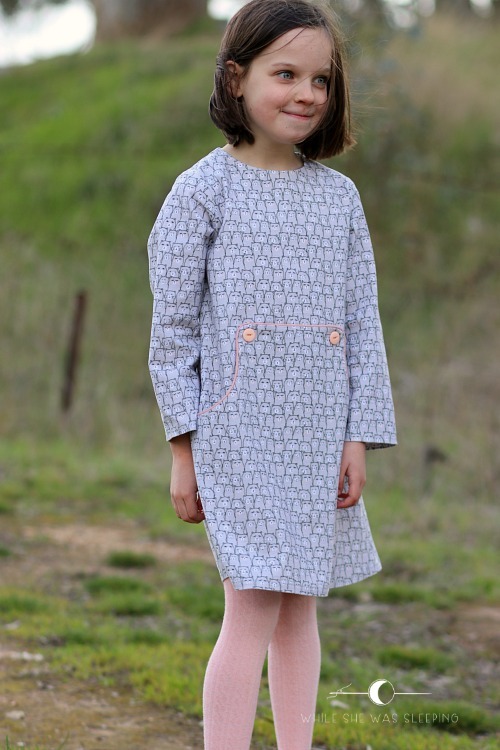 The kitty fabric promptly was turned into a Louisa dress* for my sweet cat lover. 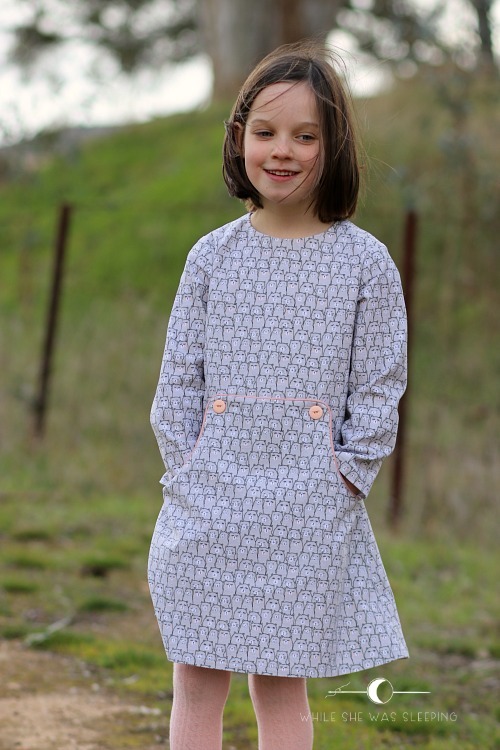 I wanted the print to be the main feature of the dress so opted for the most simple view of the pattern. A little pop of colour thanks to piping and vintage buttons, and the happiness levels of my already very happy kiddo went through the roof! So if you want to become a parent of the year get your kid a cat and sew them a kitty outfit! Ooh how sweet!! Our girls love our cat Rosie and also love to pretend they are animals - either cats or dogs!They play it at school too! So funny! I love that corduroy and have eyed it off myself! This manages to be incredibly sweet yet very elegant at the same time. I love how beautifully the color of the piping complements the kitty fabric! Thank you Emi. I knew my girlie would love the print, but I was not too sure about it myself I must admit. I wanted brighter contrast, but it looked wrong. In the end I am very pleased with the dress. As you know I am a huge fan of black and white boy cats, so a big congratulations! (I hope we get to see some photos of Boots soon). 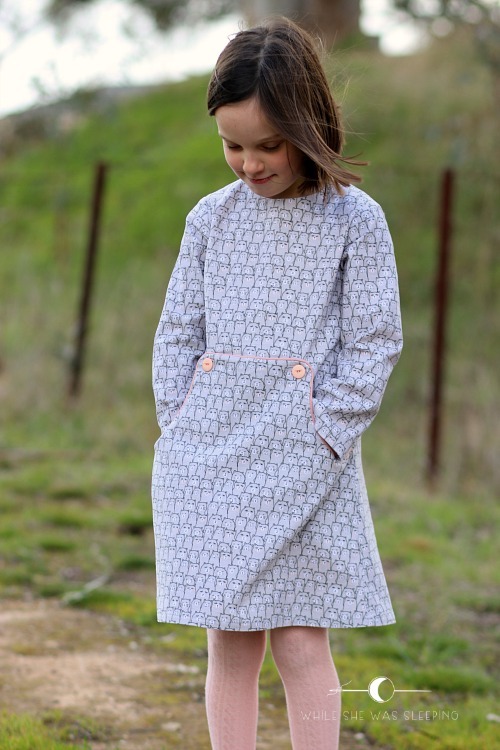 The Louisa dress is beautiful and cosy-looking and your daughter looks soooo happy! Thank you Marisa. I will try to take a pics of Boots to introduce him properly soon :) The Louisa never disappoints! So sweet, you're the best mama! My girls are still waiting for a cat, secretly I think they might be waiting til they've moved out! I wonder if cat dresses will appease them until then, yours is beautiful. This is an adorable dress! I would not have thought to use the pink accents but it really works! I love it! It's such a cute dress! I have that pattern and never made it. I need to get with the program. 😆 Glad Boots is adapting way. You are a way cooler mother, because here it's a firm 'no' to any pets requests.